How many children could have possibly seen Alien, I wonder? Did parents take their kids to see it? Perhaps a more pertinent question is this: how many children wouldn’t be scared to death by a cat or dog-sized action figure with retractable inner jaw and an eyeless, human skull for a head? Well, I didn’t see the movie (I was nine), and I still wanted the toy. Desperately. 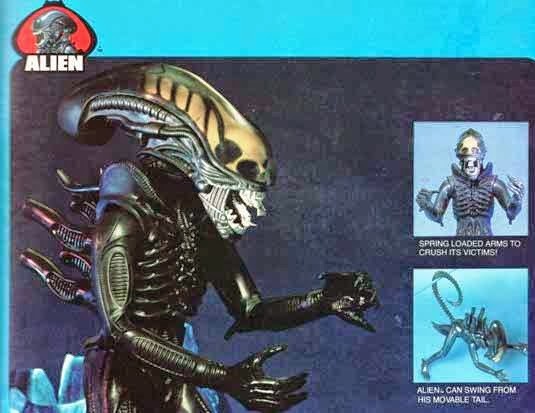 I feel like a lot of kids my age wanted the Alien toy too, whether or not they had seen the film, but apparently parents complained about Kenner’s masterpiece of horror and, legendarily, the toy sold poorly. The alien was thus pulled from toy shelves at the behest of concerned parents and terrified children, and a generation of psychologists grew rich treating the PTSD of innocent children who happened down the aisle hoping to buy a plus R2-D2, only to catch sight of this leering, plastic monstrosity. Here's a commercial from 1979.